LEETONIA — Kenzee Johnston scored a game-high 13 points and Jaliyah Mixon totaled 12 points, 18 rebounds and four steals as East Palestine doubled up Leetonia, 44-20, Monday. The Bulldogs improve to 7-3 in the Eastern Ohio Athletic Conference, while the Bears fall to 8-6 overall and 4-6 in the EOAC. Sara Buskirk contributed 14 rebounds and Payton Sharry dished out seven assists. For the Bears, Ari Russell had 10 rebounds and six steals and Taran Ferry had three assists. Leetonia won the junior varsity game, 25-24. Madelyn Steiskal and Allison Francosky each had six points for the Bears. Paige Snyder had nine points for the Bulldogs. EAST PALESTINE SCORING: Jade McBride 0-2-2, Paige Snyder 3-0-6, Kenzee Johnston 5-2-13, Sara Buskirk 1-1-3, Jamie Jones 0-2-2, Joclyn Fristik 3-0-6, Payton Sherry 0-0-0, Jaliyah Mixon 5-2-12. TEAM TOTALS: 17-46, 9-17: 44. LEETONIA SCORING: Anna Buffone 0-5-5, Kylie Tullis 2-0-4, Taran Ferry 1-1-3, Kalie Eastek 1-0-2, Ari Russell 2-0-4, Samantha Schneider 0-0-0, Haleigh Brock 1-0-2. TEAM TOTALS: 7-40, 6-22: 20. Three-point goals: East Palestine 1 (Johnston). COLUMBIANA — Kayla Muslovski scored 23 of her game-high 28 points in the middle two quarters as Columbiana rolled over Wellsville, 67-23, Monday. The Clippers (10-3) are closing in on a sixth straight league title as they improve to 10-0 in the Eastern Ohio Athletic Conference. Columbiana jumped out to a 16-5 lead in the first quarter thanks to a pair of Tori Long three-pointers and the Clippers never looked back. Tessa Liggett contributed 12 points, six rebounds and four steals and Long added Long nine points, all in the first half. Kenneduy Fullum had five rebounds and Karissa Tringhese made five steals. Cameron Carlevale had 10 points, six rebounds and two blocks for the Tigers, who are 0-14 overall and 0-10 in the EOAC. Marie Cline had five rebounds and Camryn Jackson two assists. Columbiana also won the two-quarter junior varsity game, 27-5. Columbiana’s Madison Moser and Wellsville’s Dehaven Dobritz each scored five points. Wellsville will host Southern on Thursday, while Columbiana travels to Lisbon on Friday. WELLSVILLE SCORING: Abigail Cline 0-0-0, Leah Vinton 1-0-2, Camryn Jackson 0-0-0, Dehaven Dobritz 1-1-3, Cameron Carlevale 4-2-10, Thomas 0-0-0, Durbin 0-0-0, Marie Cline 1-1-3, Kiki Perry 2-1-5. TEAM TOTALS: 9, 5-11: 23. COLUMBIANA SCORING: Karissa Tringhese 0-0-0, Kayla Muslovski 11-4-28, Tessa Liggett 5-0-12, Grace Hammond 1-1-4, Kennedy Fullum 2-1-5, Tori Long 3-1-9, Grace Witmer 1-0-2, Madison Moser 2-0-5, Tami Ross 0-0-0, Morgan Dunlap 0-0-0, Sierra Macklin 1-0-2. TEAM TOTALS: 26-75, 7-14: 67. Three-point goals: Columbiana 8-35 (Muslovski 2, Liggett 2, Long 2, Hammond, Moser). BELOIT — Eleven West Branch players collected field goals as the state-ranked Warriors had a field day against Garrettsville Garfield, 61-25, Monday. The Warriors opened up a 19-4 lead in the first quarter and were on their way. Carly Scarpitti led the charge with a game-high 13 points. Grace Heath and Peyton Alazaus each added nine points. Maddie Showalter grabbed six rebounds. West Branch improves to 11-3 overall, while Garfield drops to 9-5. Grace Mills topped Garfield with 11 points. West Branch also won the junior varsity game, 50-21. The Warriors will play at Canton South on Wednesday. GARFIELD SCORING: Grace Mills 4-1-11, Williamson 1-0-2, Lawrence 1-0-2, Miller 1-0-2, Seaman 1-0-3, Smith 1-3-5, Evan 0-0-0. TEAM TOTALS: 9, 4-8: 25. WEST BRANCH SCORING: Emma Egli 1-0-2, Carly Scarpitti 5-2-13, Grace Heath 4-0-9, Bella Laut 3-0-6, Sammie Tuel 2-0-4, Riley Tuel 2-1-5, Elizabeth Ostadali 1-0-2, Maddie Showalter 0-0-0, Anna Lippiatt 1-0-3, Jillian Pidgeon 1-0-2, Peyton Alazaus 3-2-9, Jessica Bock 3-0-6. TEAM TOTALS: 26, 5-6: 61. Three-point goals: Garfield 3 (Mills 2, Seaman), West Branch 4 (Scrapitti, Heath, Lippiatt, Alazaus). RICHMOND — The Beaver Local put up another win Monday and junior Jenna Riccardo put her name in the record books. Riccardo scored her 1,000th career point as she totaled 20 points and 16 rebounds in leading the Beavers past Edison, 90-27. Riccardo became the third Beaver Local girl to reach the mark and currently has 1,005 points. The game was stopped when she got her 1,000th point in the second quarter and she was given the game ball. After the Beavers opened up a 54-10 halftime lead, Riccardo saw limited action in the secon half. “She is very humble and very quick to give credit to all here teammates,” Coie said. She joins Rachel McCoy (1,215) and Mallory Yajko (1,086) at the top of Beaver Local’s list. It was also a night to remember for junior Madison Cline, who had a career-high 20 points. Freshman Elizabeth Kolkowski contributed 14 points and 10 rebounds. Riley Britt had nine points and seven assists, Chansyn Hoppel nine points and Madison Ours eight points and five assists. The Beavers improve to 7-6 on the season. It was a good night all around for the Riccardo family. Leah Riccardo, Jenna’s younger sister, had a game-high 13 points as the Beaver Local junior varsity team posted a 36-9 win. The Beavers will play at East Liverpool on Thursday. BEAVER SCORING: Riley Britt 3-0-9, Sydnie Holden 2-0-4, Chansyn Hoppel 4-0-9, Madison Ours 4-0-8, Brooke Briggs 0-0-0, Elizabeth Kolkowski 7-0-14, Madison Cline 9-2-20, Jenna Riccardo 5-10-20, Alexia Harding 1-0-2, Jensen Britt 1-0-2, Halle Jordan 0-0-0, Leah Riccardo 1-0-2. TEAM TOTALS: 37, 12-14: 90. EDISON SCORING: T. Furbee 0-1-1, M. Petrisko 1-0-2, A. Fiedorczyk 2-0-4, A. Meadows 0-1-1, A. Grafton 1-2-4, L. Ferralli 3-0-7, S. Keenan 3-2-8. TEAM TOTALS: 10, 6-13: 27. Three-point goals: Beaver 4 (Britt 3, Hoppel), Edison 1 (Ferralli). SALINEVILLE — United got 26 points from Celeste Hofmeister in a 55-29 win over Southern on Monday in Eastern Ohio Athletic Conference action. Loren Swords added 16 for the Eagles. Southern (2-11) was led by Riley Felton’s 14 points, three assists, five blocks and four steals. United won the jayvee game 21-3. UNITED SCORING: Loren Swords 6-3-16, Kyleigh Daggy 2-0-5, Celeste Powers 1-2-4, Destiny Hill 2-0-4, Celeste Hofmeister 11-3-26. TEAM TOTALS: 22, 9-11: 55. SOUTHERN SCORING: Delainey Mellott 1-0-3, Aubriana Mellott 0-1-1, Sam Michael 1-3-5, Lindsay Ingledue 3-0-6, Riley Felton 5-4-14, Ronni Mayfield 0-0-0. TEAM TOTALS: 10, 8-17: 29. Three-point goals: United 3 (Swords, Kyleigh Daggy, Hofmeister), Southern 1 (Mellott). NEW MIDDLETOWN — Dani Vuletich had 21 points and six rebounds, while Alyssa Serensky added 16 points as Western Reserve topped Springfield 73-41 on Monday in Mahoning Valley Athletic Conference action. Mariah Johnson and Ellie Centofanti had nine points each for Springfield. Western Reserve is 14-1 and hosts Lowellville on Thursday. Western Reserve won the two-quarter jayvee game, 21-12. Morgan Donithan had seven points for the winners. W. RESERVE SCORING: Brooke Morris 1-0-2, Maddy Owen 1-0-2, Abby Gay 0-0-0, Laura Sigworth 6-1-16, Kennedy Miller 2-1-5, Olivia Pater 0-2-2, Erica DeZee 2-0-5, Dani Vuletich 10-1-21, Jenna Heater 0-0-0, Alyssa Serensky 6-3-16, Morgan Donithan 2-0-4. TEAM TOTALS: 30, 8-10: 73. SPRINGFIELD SCORING: Marlie Applegarth 2-0-5, Makenzy Capouellez 3-0-8, Ellie Centofanti 3-2-9, Kaila LaMorticella 1-0-2, Kylee Kosek 2-2-6, Abby Joseph 1-0-2, Macy Centofanti 0-0-0, Mariah Johnson 3-2-9, Gianna Santangelo 0-0-0, Nicole D’Angelo 0-0-0. TEAM TOTALS: 15, 6-7: 41. Three-point goals: Western Reserve 5 (Sigworth 3, DeZee, Serensky), Springfield 5 (Capouellez 2, Applegarth, Centofanti, Johnson). SEBRING — Sebring’s girls basketball team broke a 39-game league losing streak by stopping Lowellville 35-31 in overtime on Monday night in Mahoning Valley Athletic Conference play. Sebring was led by Kyleisha Jays’ eight points. Sebring has four wins on the season after having a total of three the past two seasons. Sebring hosts Springfield on Thursday. LOWELLVILLE SCORING: Mariah Bellis 2-5-9, Sam Moore 1-8-10, Maliyah Hedrick 1-0-3, Julianna Lellio 0-2-2, Emalee McGarry 3-1-7. TEAM TOTALS: 8, 16-28: 31. SEBRING SCORING: Kyleisha Jays 1-6-8, Bella Meir 1-0-2, Emma Whaley 2-3-7, Aebi D’Ostroph 2-2-6, Delaney Reggi 3-0-6, Bryanne Luca 0-0-0, Devyn Reggi 2-1-6. TEAM TOTALS: 11, 12-19. POLAND — Poland knocked off South Range 57-43 in Northeast 8 action on Monday. South Range is 6-6 and 5-3 in the league. Izzy Lamparty had 18 points and 12 rebounds. Bri Modic added 10 points. The Raiders are at Lakeview on Thursday. ZOARVILLE — Tusky Valley topped Minerva 48-29 on Monday in girls basketball action. Minerva falls to 10-3. Tusky Valley is 11-3. MINERVA SCORING: Foutz 0, 1-2, 1; Yankovich 2, 2-2, 7; Imler 2, 1-4, 5; Wayts 1, 0-0, 2; Miller 0, 2-2, 2; Wheeler 1, 0-0, 2; Rhodes 2, 2-2, 6; Slentz 1, 0-0, 2; Walton 1, 0-0, 2. TEAM TOTALS: 10, 8-12: 29. 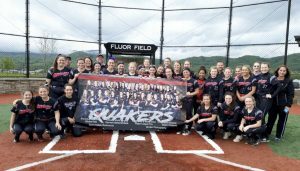 TUSKY VALLEY SCORING: Dillon 1, 2-2, 4; Williams 1, 0-0, 2; Levengood 3, 2-3, 8; Kuykendall 8, 0-0, 18; Shane 6, 2-2, 14; Ernst 1, 0-0, 2; TEAM TOTALS: 20, 6-7, 48. Three-point goals: Minerva 1 (Yankovich), Tusky Valley 2 (Kuykendall). COLUMBIANA — Sydney Ogden had 11 points but Heartland’s girls basketball team fell 63-24 to Maplewood on Monday. Heartland trailed Maplewood 19-13 after a quarter but then could not register more than six points in the final three quarters.